Breathtaking photographs and original essays illuminate this tribute to the natural wonders of the Blue Ridge Parkway. The 469 miles of the Parkway run through some of the most magnificent landscapes in the US, connecting the Shenandoah National Park to the Great Smoky Mountains National Park and the photographs capture the unique beauty of the region. Accompanying the images are the heartfelt writings of the regional poets and essayists who celebrate their abiding love for the Blue Ridge Mountains. 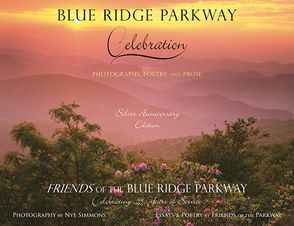 It celebrates the Blue Ridge Parkway and the 25 years of service provided by FRIENDS of the Blue Ridge Parkway.